I've made many trips to the Greek Islands over the past 11 years. 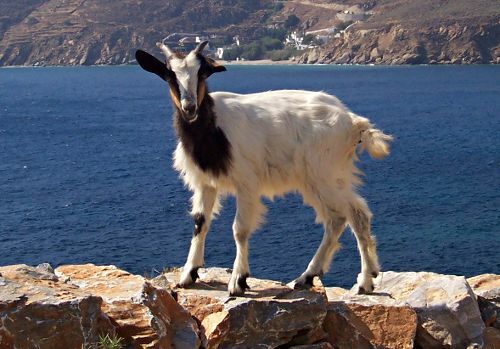 Here are a few tips on traveling the Greek Islands as cheaply as possible. There are two main types of ferries: regular, and high speed. If you're on a budget try to catch the regular slower ferries because they are typically cheaper. 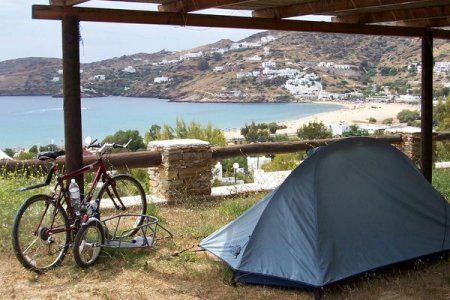 There is a network of seven campgrounds in the Cyclades called Kyklades Camping that includes Camping Koula (Paros), Maragas Camping (Naxos), Far Out Camping (Ios), Paradise Camping (Mykonos), Two Hearts Camping (Syros), Achivalolimni Camping Bungalows (Milos), and Camping Santorini (Thira). You can pick up a brochure at any of the member campgrounds. The brochure gives you discounts for each campground you stay at when you get the brochure stamped. There are also many other campgrounds throughout the islands--just search Google and then send the campground an email in advance to see if they are open (low season) or have availability (high season). There aren't many hostels in Greece, but you can find dormitory accommodation in Athens, Paros, Naxos, Santorini, Mykonos, Crete, Rhodes, Kos, and possibly a few other places. Sometimes the dorms are at campgrounds and you have to check their websites or ask them to get information. Printed guidebooks sometimes list campgrounds with dorm accommodation. 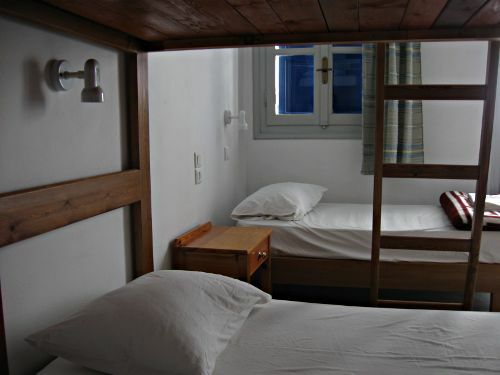 Hostel beds are typically around €7 to €12 per night (in 2010), though sometimes more in the most touristy places like Fira, Santorini and parts of Athens. If you're traveling in a group of two or more persons, getting rooms can be an affordable option. I suspect the more like a backpacker you look, the cheaper the room. Many years ago, I paid the equivalent of $20 for a room in Samos, while meeting an older Swedish woman who was charged $60 for a room at the same place. My theory is that rooms in Greece cost more if you travel with a suitcase instead of a backpack. Early in the season, prices should be a bit lower--perhaps €15 to €18 for a nice private room. Finding rooms is usually very easy. In high season, when you get off a ferry, there are typically many locals waiting with signs and brochures trying to get you to stay at their accommodation. Ask to see a map of the location before going with them, because a few of the hotels in bad locations will say anything to get you to go with them. 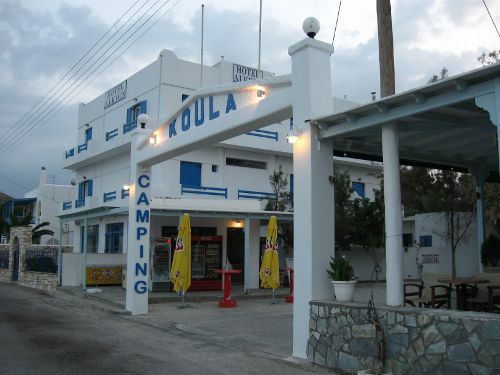 "Located in Agia Anna Beach" might mean "located 15 minutes walk from Agia Anna Beach". 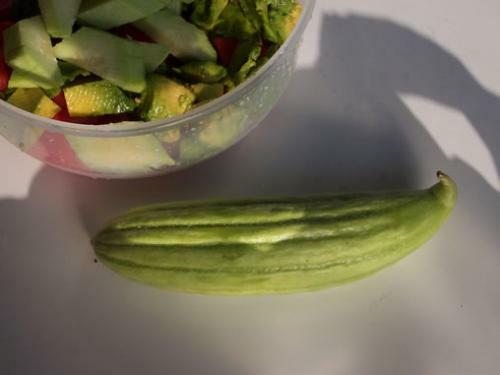 If you're alone, it's often cheaper to eat out (take away) than to cook your own food. 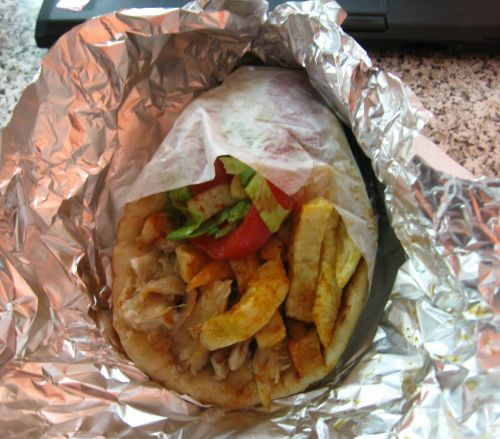 Pita gyros are typically between two and three euros. I try not to eat gyros too often because they don't seem very healthy. 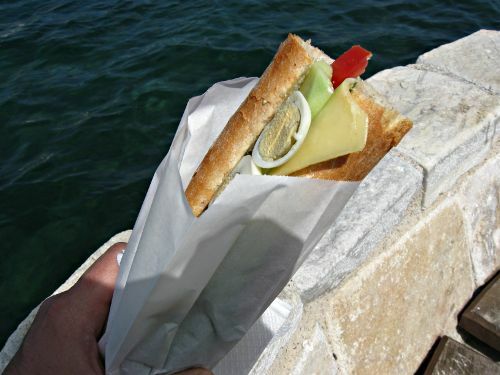 I think a healthier budget alternative is to eat sandwiches which you can find for between 2.5 and 3.5 euros in all but the most touristy locations. 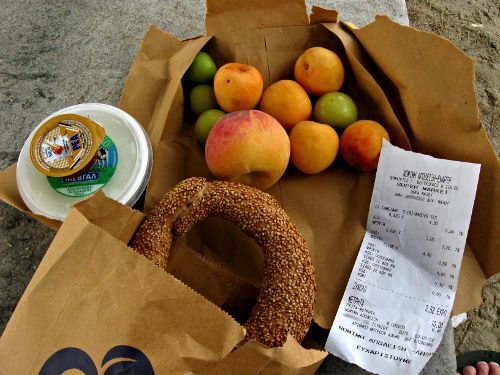 Fruit, vegetables, and yogurt are also very cheap in Greece. Eating in restaurants is more expensive. A restaurant meal (not including cheap pita gyros) will probably cost a minimum of €5 to €10, and more expensive in the very touristy locations. If you want to drink, a liter of decent wine shouldn't cost much more than a few euros. In Crete, raki (tsikoudia) is cheap. A beer at a taverna or cafe generally ranges from €2 to €4. Submitted by Neilson Reeves (not verified) on Thu, 01/03/2013 - 07:13. Submitted by Anonymous (not verified) on Mon, 03/11/2013 - 03:30.
i like the suitcase v backpack tip! Submitted by justjoan (not verified) on Wed, 06/05/2013 - 05:03. Glad to have run into this post. I just returned from traveling on a budget through Italy, France and Spain, trying various forms of lodging - sharing an apartment, guest houses, budget family hotels, b&bs and couch surfing. Amazing how cheaply one can travel. After the wonderful experience, I decided Greece is my next destination. I have been toying with the idea of camping, so this post is helpful. My concern is moving around with the extra weight. I traveled with only a day pack.